Donald Trump has set a course for nothing short than a turn to fascism, and Theresa May is backing it to the hilt. In the last few weeks Trump has brought forward a raft of executive orders that will embolden every white nationalist, and now Iran is in the cross-hairs. The wall is being built, and the process for banning Muslims entering the US is underway. This is a time to fight back. Trump is the apex of an insurgency of the international far-right. Theresa May is setting herself up as the key Trump ally. She has nothing but praise for his regime, and is even using the NHS as a bargaining chip for a Trump trade deal. She says that together with Trump the U.S. and UK will ‘lead the world.’ But there has been a huge response. 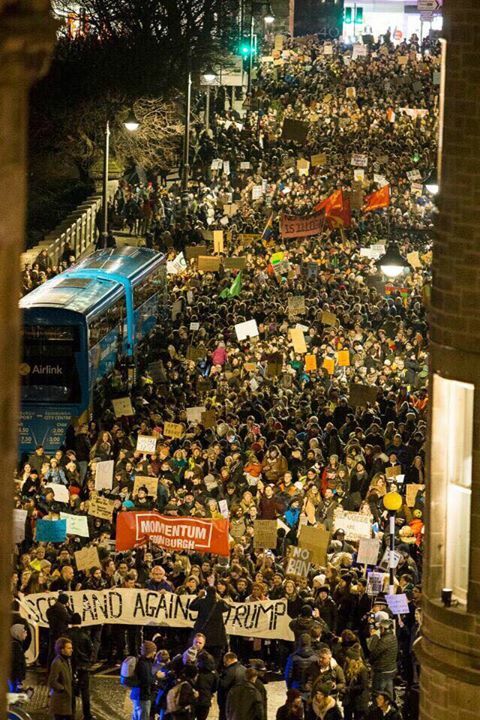 The protests across the UK have been magnificent, and now there is real pressure on Theresa May to stop Trumps state visit. That would be a huge victory – and by keeping up the pressure we can do it. Following our demonstration in Edinburgh where thousands marched at 24 hours notice, we are calling for a national demonstration to assemble the Meadows, 12noon on Saturday 11th February. We will march past the US Consulate and rally at the Scottish Parliament. Do they really know what they are marching for or against? these fourth estate drones. Donald is utilising all the characteristic Scottish values and traits inherited from his mother. There is every chance he will be remembered as the most significant POTUS in history. Did you choose your words carefully? The word significant has neither positive nor negative connotations. Let’s just hope he is as constrained by the rest of the USA’s political and judicial system, that he is precluded from introducing us to ‘End Times’. Now, that would be significant, but not in a nice way. James Dow’s question “Do they really know what they are marching for or against?” is pertinent. I think the rhetoric being used against Trump, as in this article “Trump is the apex of an insurgency of the international far-right.” is inflamatory and unhelpful. You might not like Trump but whatever he is he is the democratically elected president of the USA. He is also proud of his Scottish roots. Sometimes you have to dance to the devils tune. …”proud of his Scottish roots”. LOL. He is. Why do you find that funny? Its a fact. He has visited the Hebrides fairly recently to visit his relatives. I think she came from Lewis. I’ve seen photos of him with his cousins. What the Falkirk is your problem with simple facts? The president of the USA, his mother came from the Outer Hebrides and he is proud of the fact. If you as the editor of a Scottish current affairs website, a website that claims to stand up for Scotland’s interests cant see the relevance of this then you seriously need to stand back and ask yourself what it is you are trying to achieve. I find it funny because the idea of him being ‘proud of his Scottish roots’ somehow being of more interest or value or importance than the hellish geopolitical consequences of his sociopathic actions is so apolitically stupid it’s not really possible to respond other than to laugh or to cry a primal scream of despair. LOL seemed better at the time. Popular opinion in both Britain and Australia where I live in regards to Donald Trump was fashioned to suit the agenda of his opponents. I worked in management for Rupert Murdoch in three press plants in OZ for over twenty five years, I’m pretty sure I know how it works. He who owns the press controls the narrative. Mike Small I question your even handed ness as an editor. Your personal prejudice should never overwhelm your point of view to the extent you project yourself as the master of the subject without review. Let us revisit Donald the Deliverers outcome in a couple of years. I might be interested in your opinion of actual reality, unlike the artificial construct we are being presented with today. All I see In the Trump protests in Scotland is the display of power the fourth estate still has over Scotland. Although half a world away I am always spiritually bonded to my land, my home, Scotland. Yes I did when I said ” there is every chance” meaning in normal circumstances given the time and the will to achieve the desired restoration of America. I am not in charge of any future calamity that might intervene. Wish your last name had an e on the end of it. Actually, The Donald speaks for quite a lot of us on the non pc-neoliberal Scottish patriotic indy soft left. He is also the most famous Scotsman on the planet, e’en mair famous than milkman Shir Tam. And there is probably just as much chance of The Donald achieving Scottish independence as the too pc neoliberal for their own good Nicola or Alex or any other political timeserver groaning at the unionist public sector feeding trough for the past 20-30 years or so; 56 ‘indy’ MPs and still they ask for permission fi thair unionist maisters tae hold a ref2. Tak oor indy and be duin wi it! ‘Neoliberal indy left’ – run that by me again Alfie? Judging by the turnout in Edinburgh it looks like the ‘turn to fascism’ is being met with ambivalence on the part of most Scots…or maybe the public knows something that the radical left doesn’t….